Disclaimer: This post has no intention to be a review of any of the games mentioned, this is just an overview and report of the first impressions we got at the very first time the games mentioned hit our table. 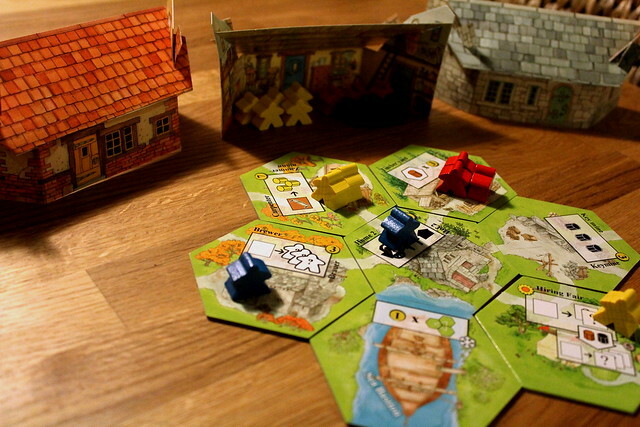 Full reviews are written after the game is played several times with different player configurations. As soon as the reviews are available on Meople’s Magazine this post will be updated with the links for those reviews. The next game on the queue was Columba. This one we actually tried it in Essen. We saw the free table and decided to give it a go just because it was an empty table and a good-looking game. But unlike many other games we tried or saw in Essen, we hadn’t read about it at all and it was a very nice discovery. It has a very peaceful theme: it is about keeping doves and the unusual and beautiful illustrations go well with that theme. 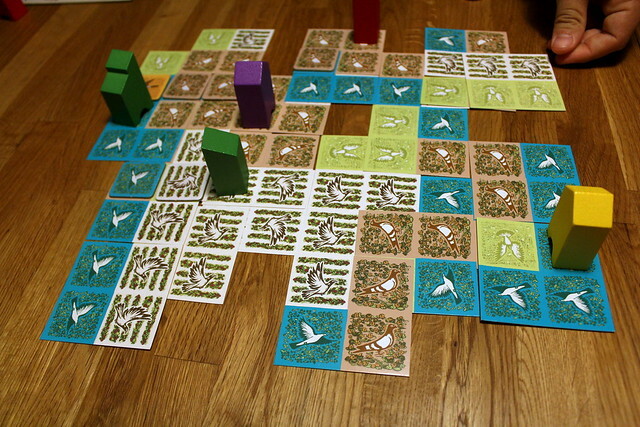 But in reality the game plays like an abstract area control game with a lot of opportunities to pester your opponents, like covering the birds they need to complete their goal tiles. Or splitting their areas with your falcons avoiding them to score many points with their dovecotes. Even though the rules are really simple, this game is quite tactical and the team play dynamic is just brilliant. We still need to try it in three and two players and I hope the game play is as good as it is in 4 players. Keyflower is another game we tried in Essen, we were attracted to the booth by the amazing amount of colouful meeples (they call them keyples) and meeple houses! There we were only two people, our first try at home was with five players which resulted in a very different playing experience. Keyflower is a mix of an auction and worker placement game played in four rounds, each one for one of the seasons of the year. The objective is to build your village. The keyples are used to bid for tiles to grow your village which can bring you victory points. Or they’re sent to village tiles to execute the action the tile allows, that can bring you resources, more workers, tools, etc. – even if the tile belongs to another player. The owner of the tile gets the keyples placed there at the end of the round. In the two player game, the whole thing was very tactical and you could plan for what to do next. In five players it became much harder to predict anything or plan how to score. The competition for the tiles that bring points at the end is hard, they become expensive and then you have no keyples left to use actions to get the resources you need. Trying to prevent others from getting tiles they need to score doesn’t really help you much, you have to adapt your play too much and lose your chance to win. I am looking forward to play it again… maybe with three or four players next time.